Wall Clock | Color Ink, Inc. Welcome to the second edition of How It Works, a chronicle of each item offered from FunDeco furniture & decor. Our next piece up for examination is the ever-popular Wall Clock. FunDeco Wall Clocks are made of the same rigid, lightweight material that is used in our Serving Centers, Bean Bag Toss Games, Pub Tables, and more. 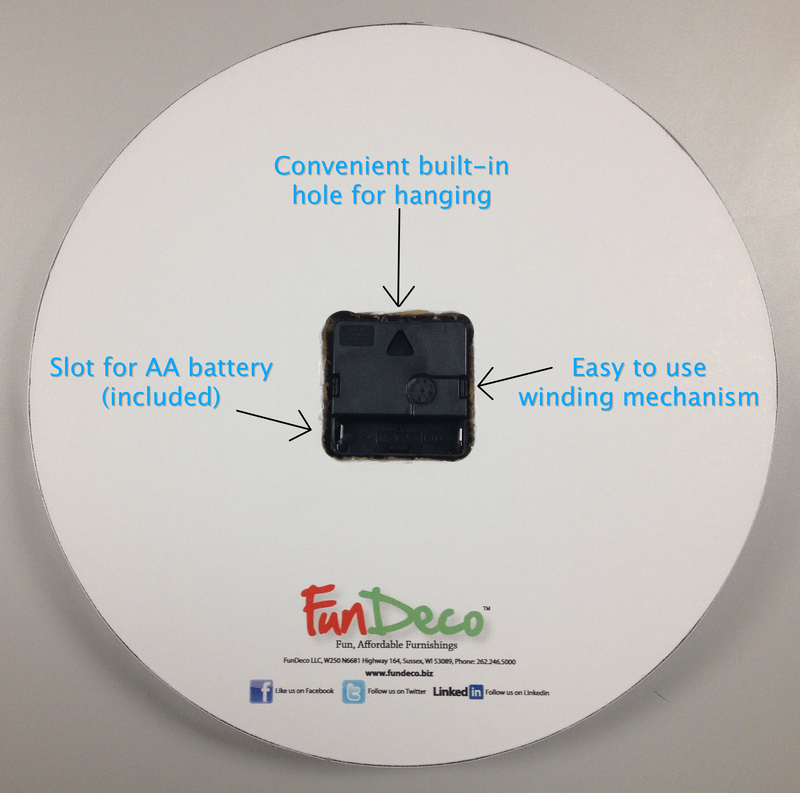 When you receive your clock you will find an instruction sheet, return form, AA battery, and parts warranty enclosed. The set-up couldn’t be easier. Place the battery into the slot on the back of the clock, then simply wind the crank on the timekeeping mechanism til you’ve got the correct time. Done. The chrome edging is already attached, along with the clock hands and winding mechanism. Hang on the wall via the built-in hole and you’ll never be late again! Flip the clock to the backside to view the quartz time mechanism. Also, for just $21, you can create your very own custom clock with any image you’d like! Click here to start!